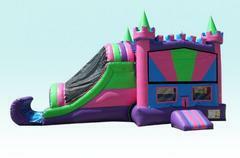 ABouncinGoodtimeMoonwalks.com provides water slide combo bouncer rentals in central Florida and the Lakeland, Winter Haven areas. The combo bouncer unit is a great way to provide your guests the best of our slide options and bounce house options with an added basketball net inside. Our combo units are great for smaller yards or as an addition to another unit. A Bouncin' Good Time Moonwalks offers only the highest quality in party entertainment rentals for our central Florida customers. We do not service public parks for personal parties. Sorry for the inconvenience, IF YOU RESERVE ONLINE, WE WILL CANCEL YOUR RESERVATION.